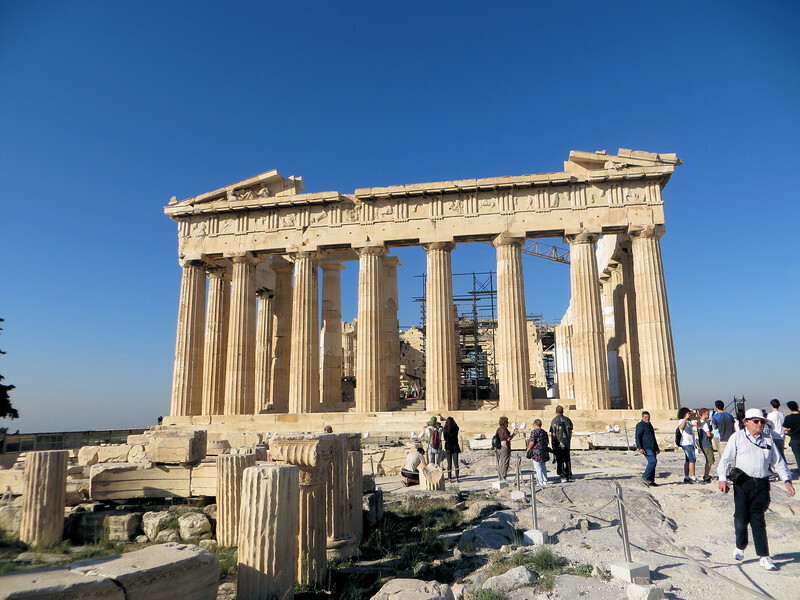 Besides being beautiful to look at, the Parthenon is a work of architectural genius. It was the first temple to be made entirely of marble, from a quarry about 10 miles away. It was larger than most temples. Its most exceptional feature is the optical illusions used to give "an ever-so-subtle feeling of balance, strength, and harmonious beauty" (Rick Steves.) A long flat baseline on a building appears to be sagging, so the base of the Parthenon actually arches several inches upward in the middle to counteract this. Parallel columns appear to bend away from each other, so these columns tilt slightly inward. (Rick Steves says that if you extended all the columns upward for several miles, they would eventually touch.) The corner columns are thicker to make them appear the same size as the rest. And they bulge slightly about halfway up, giving a subconscious impression of muscular strength. For a building that looks like it's all about straight lines, there are very few actual straight lines in it.